These are the perfect balance of savory and sweet, and fuss-free because you don’t have to peel the skin of the Delicate squash, so it’s pretty easy to prepare. Roasting Delicata brings out the flavor which makes a great Fall side dish with just about everything from chicken, to roasts and chops. I’ve been picking them up from Trader Joe’s but also see them in my supermarket. They have a shorter season than butternut so enjoy them before it’s too late! You can season them any way you wish, but I love any excuse to get more turmeric in my diet because of it’s health benefits and the flavor is wonderful. The perfect balance of savory and sweet, and fuss-free because you don’t have to peel the skin of the Delicate squash, so it’s pretty easy to prepare. Roasting Delicata brings out the flavor which makes a great Fall side dish with just about everything from chicken, to roasts and chops. Made this tonight and it was SO good! Thank you so much! 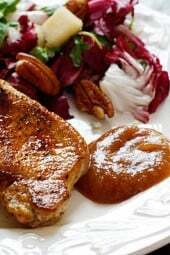 This recipe was easy to make and delicious to eat. Will definitely be making this frequently. I made this last night and me and the bf gobbled it right up! 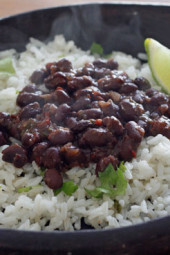 Super easy and delish, I really enjoyed the addition of fresh cilantro with it. I paired it with a lentil quinoa salad with cranberry and pepitas. It made a wonderful light dinner! Made this tonight. Had never had Delicata Squash before but saw others commenting on it on the Facebook feed. It was fantastic! So tasty. Thanks for the great addition to my recipes! Made this in 2 batches in my toaster oven last night (oven is broke). This is phenomenal!!!!!!!!! Can’t wait to throw this in the oven tonight!! A Double Gina! Tonight I did this recipe with the toasted sesame seed chicken tenders, all in the oven at the same time and temp, PERFECT supper! Just made this recipe. Results? DElicious!! I was afraid to eat the skin but I tried it and what do you know, you really can eat the skin. My husband loved this too. 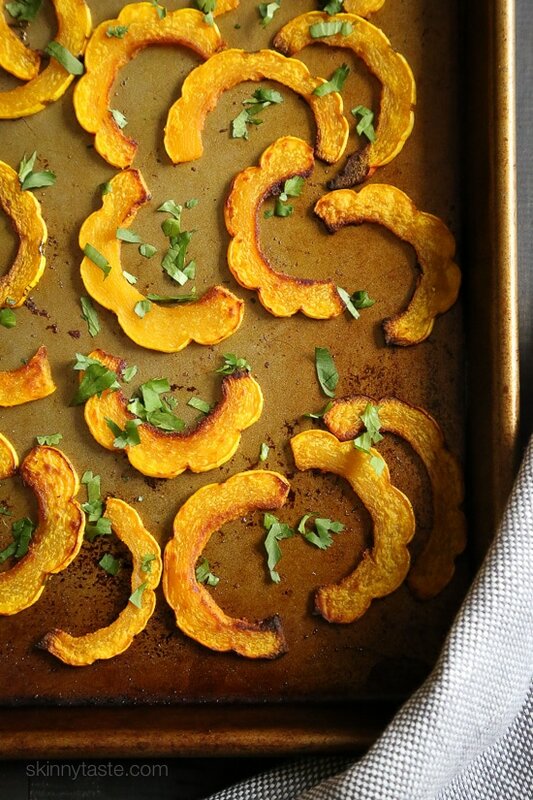 It’s our new favorite squash. Have made these numerous times now – LOVE them. My sister thought her version of plain salt+pepper was better, so I tried that. Wrong. These are better than eating french fries. Mmmmm. I don’t understand why this is not low-carb? 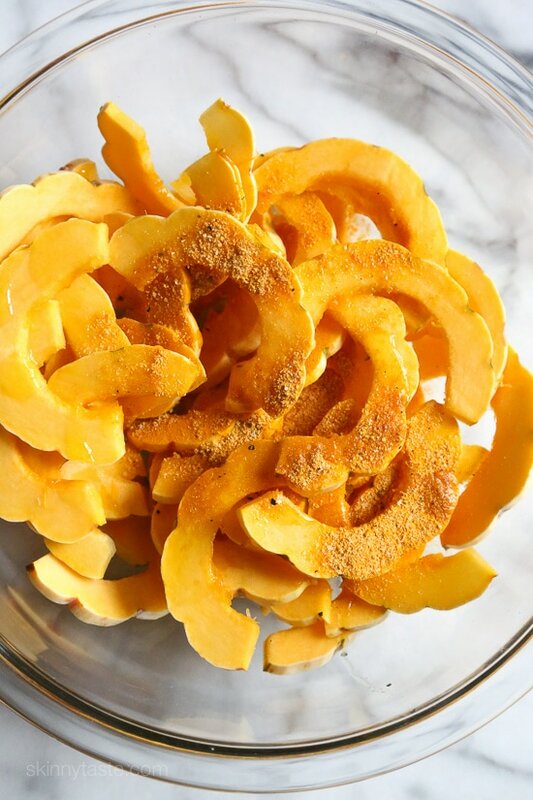 1/2 cup of delicata squash has less than 5 carbs, plus negligible amounts in the turmeric and garlic powder. should make this a very-low carb dish per serving? I added everything up and divided by four servings and I got 68 calories and 5.3 grams of carbs per serving. Thanks for easy, excellent and YUMMY recipe! Delicious, thank you.. Can I keep it for tomorrow? did any one try to eat it cold in salad? did anyone try to warm it up the next day? This was so delicious. Always looking for new veggies to try. Even the not loving vegetables that much husband had a second helping! I made this and it was amazing! I also roasted some french green beans with it and served it with some smoky flavored sausage. Yum! Hi Gina! I made this yesterday for family along with your Crockpot Balsamic Pork Roast, and the Cauliflower/Kale Mash. SPECTACULAR! This squash was so easy to make. I notice the recipe says 10-14 minutes each side, but mine was pretty much done after the first 12-14 minutes. I did flip it and roasted for another five minutes maybe. PERFECT! Thanks so much. Loved it. I used Safflower Oil instead of EVOO. Sometimes I find the EVOO flavor overtakes the produce. Safflower Oil really doesn’t have any taste! This simple recipe for roasted squash was a huge hit! It was my first time trying Delicata squash (and I rarely ever use Turmeric), but I will definitely be making this recipe again. Thank you for all the work you do to bring us all these WONDERFUL recipes….it is appreciate. Omg! My mom and I made this tonight after hitting the farmers market. AMAZING!!!! Already planning on making again later this week!!! Is Sweet Dumpling the same squash? They are both winter squashes but no they are different. 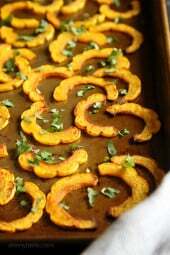 I picked up delicata squash a few days ago and I just tried this recipe and it’s delicious! This is my first time eating delicata squash and I’ll definitely be buying it often. I’m looking forward to trying your stuffed delicata squash next. This looks amazing! 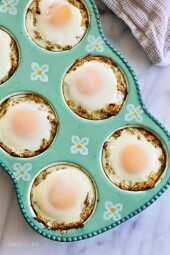 I’ll definitely be trying out this recipe asap! Question. Do you peel it first? And if no the do you eat the peeling? Can the skin of the squash be eaten? I made this last night along with the navy bean and bacon soup and both was delicious! Love your blog and cookbook. They have become my only sources for great recipes and they never lets me down. I made the delicata stuffed with sausage, and it was delicious. I wasn’t aware that the skin was edible. I’ll have to try this recipe tonight. ???? i have a delicata squash from Trader Joe’s sitting on my kitchen counter ready for tonight’s dinner and up pops your recipe. 40 pounds down since January, thanks to you! 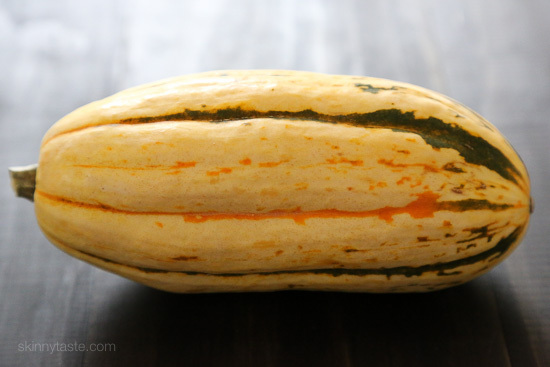 I have a delicata squash in my pantry right now that I was going to cook for dinner but wasn’t sure what to do. Now I have an idea!